The stamps of Italy went through a major transition in 1879. King Victor Emmanuel II died on January 9, 1878, and his oldest son, Umberto, became king. This required the issue of a brand new series of definitive postage stamps with the portrait of the new king. 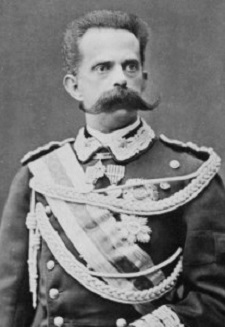 Umberto Ranieri Carlo Emanuele Giovanni Maria Ferdinando Eugenio of the House of Savoy became the King of Italy, as King Umberto I, following the death of his highly esteemed father. He did much to expand Italian colonial influence in North Africa, but his conservative domestic policies alienated him from his subjects. A social uprising in Milan in 1898 was quelled by the use of military force against civilian rioters. After this "massacre", he was loathed by much of the Italian population. After a turbulent reign of 22 years, King Umberto I was assassinated on July 29, 1900, in retaliation for the Milan "massacre" two years earlier. He is buried in the Pantheon, next to the tomb of his father, the last member of the House of Savoy to be buried there. Portrait: Facing Portrait of Umberto I or the Arms of the House of Savoy. Watermark: WMK 140 -- Crown. The new definitive postage stamps shown above were issued on August 15, 1879. They are similar to the 1863 definitive stamp issues of King Victor Emmanuel II, but these all have the portrait of King Umberto I. ﻿5 C. (1879 - Scott #45) - Blue Green. 10 C. (1879 - Scott #46) - Claret. 20 C. (1879 - Scott #47) - Orange. 25 C. (1879 - Scott #48) - Blue. 30 C. (1879 - Scott #49) - Brown. 50 C. (1879 - Scott #50) - Violet. 2 L. (1879 - Scott #51) - Vermilion. The six new definitive postage stamps shown above were issued on August 1, 1889. These stamps feature new designs with a denomination numeral in each of the corners. The new 5 C. denomination has the Arms of the House of Savoy, and the other denominations feature the portrait of King Umberto I. ﻿5 C. (1889 - Scott #52) - Dark Green. 40 C. (1889 - Scott #53) - Brown. 45 C. (1889 - Scott #54) - Gray Green. 60 C. (1889 - Scott #55) - Violet. 1 L. (1889 - Scott #56) - Brown and Yellow, Brown and Orange. 5 L. (1889 - Scott #57) - Green and Claret. Yet another urgent need for 2 C. denomination stamps in 1890 necessitated the re-valuation of various denomination Parcel Postage stamps of 1884. In 1890 and 1891, additional concurrent definitive stamp denominations were re-valued to 2 C. and 20 C.
The definitive postage stamp issues of 1891-1896 were a complete departure from the designs of previous definitive postage stamp issues. ﻿5 C. (1891 - Scott #67) - Green. 10 C. (1896 - Scott #68) - Claret. 20 C. (1895 - Scott #69) - Orange. 25 C. (1891 - Scott #70) - Blue. 45 C. (1895 - Scott #71) - Olive Green. 5 L. (1891 - Scott #72) - Blue and Rose. New 1 C., 2 C., and 5 C. denomination stamps of Italy were issued during 1896 and 1987. They are shown above. ﻿1 C. (1896 - Scott #73) - Brown. 2 C. (1896 - Scott #74) - Orange Brown. 5 C. (1897 - Scott #75) - Green.